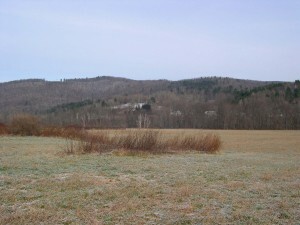 The Hopkins Forest sits in the Taconic Hills in the northwestern corner of Massachusetts (42 deg. 44′ N and 73 deg. 15′ W). This rather northerly, inland locale gives the region a cool, continental climate, with cold (mean temp. 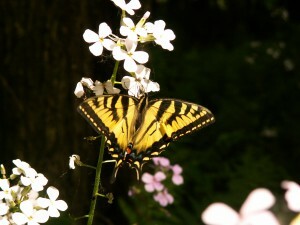 22 degrees F.), snowy winters and warm, humid summers (73 degrees F.). Average precipitation in the area is right around 40 inches with approximately one quarter of that falling as snow. The bedrock of the Taconics is predominantly phyllite of the Taconic Orogony; marble is the main underlying stratum at lower elevations of the forest. The entire area was under ice during the last glaciation with large quartzite erratics giving testimony to this history. 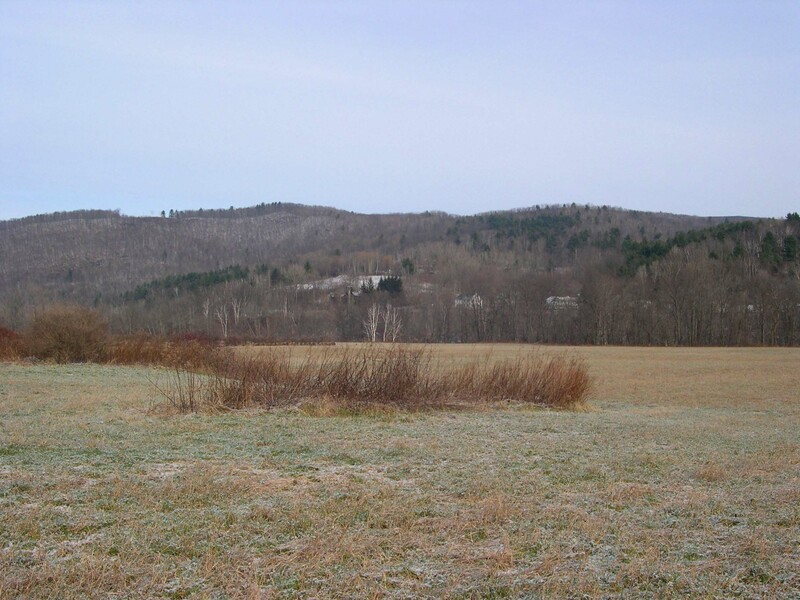 Sprawling from the Hoosic River basin in Williamstown to the crest of the Taconic Mountain Range in Eastern New York and Southwestern Vermont, the Hopkins Forest encompasses several square miles of varied forests, streams, fields and topography. 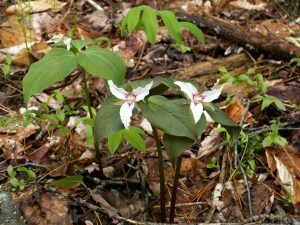 As you move up the mountain from the Hoosic floodplain (elevation: 170 meters) to the summit of the Taconic Range (745 m.) you encounter a variety of forest types that are, in part, a product of their underlying soil and topographic characteristics. 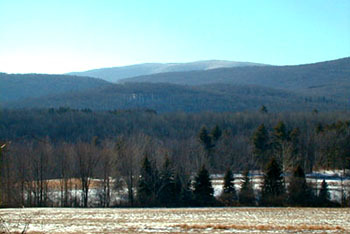 This “Northern Hardwood” forest is divided into several subsections: the rich alluvial bottomland forest that inhabits the flat, but narrow Hoosic Valley; the rich sugar maple and mixed deciduous stands (often including white ash, American basswood, bitternut hickory, American elm and American hophornbeam) that occupy the richer, marble underlain slopes below 400 meters. As the slopes steepen, these forests give way to the text-book Northern hardwood types, dominated by sugar and red maple, American beech and yellow birch (often accompanied by black cherry, white ash and Eastern Hemlock). As you traverse the drier “shoulders” of the mountain, you will notice the more open stands of red oak, sometimes accompanied by white and chestnut oaks; often they hover over thickets of blueberry, huckleberry and an occasional mountain laurel. On some of these sites you can still see living vestiges of the American chestnut that dominated them 100 years ago. High atop the mountain–where soils are quite acidic owing to their phyllite and quartzite substrata–the northern hard wood mix, in a few places, gives way to sparse stands of red spruce and Eastern Hemlock; in this area, you can still find small open glades dominated by spirea, chokeberry, and blueberry shrubs, punctuated by an occasional paper birch or white pine–persisting decades after their last disturbance. These mountain glades harbor certain northern species, such as bunchberry (Cornus canadensis) and three-toothed cinquefoil (Potentilla tridentata) that otherwise are uncommon to the area. 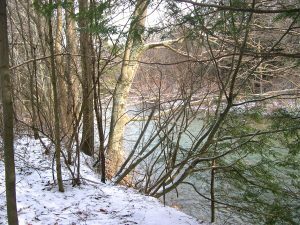 The forest has several high quality mountain streams, including the birch brook watershed, a grouping of three first order streams, which falls entirely within its boundaries. This watershed has become the focal area for hydrological and water chemistry monitoring activities. 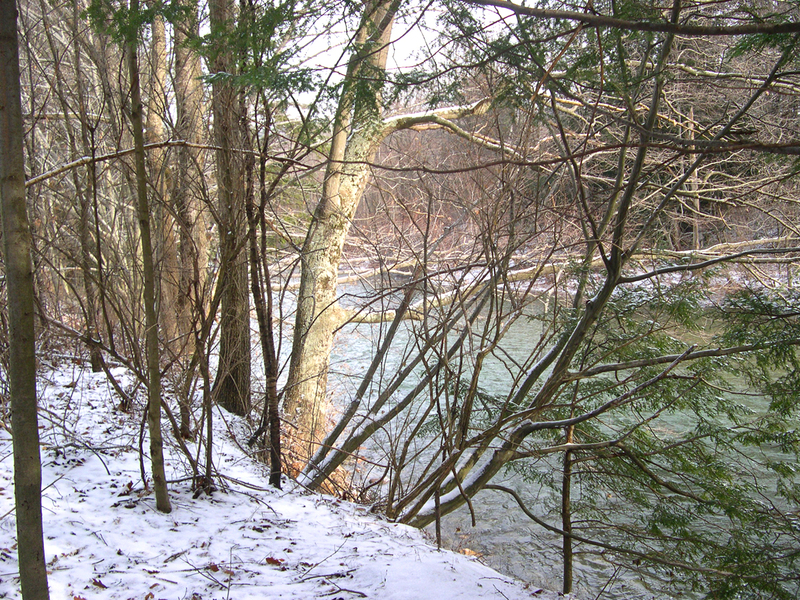 There are several other first and second order streams that flow down the slopes of the forest. Streams in the Hopkins Forest harbor a rich macroinvertebrate fauna and also house significant populations of two state rare species: The Appalachian Brook Crayfish (Cambarus bartonii) and the Northern Spring Salamander (Gyrinophilus porphyriticus). Stagnant water is sparse in the Hopkins Forest, although there are a few high quality vernal pools and small ponds within its boundaries. These pools contribute to a relatively rich amphibian life within the fores t. There are also several springs and seepage areas in the forest that create some rich local habitats. The forest has several fields including the ‘Wire Bridge Farm’. These meadows, which together account for approximately 40 acres, are maintained for research and teaching by annual mowing. Some of these ‘early successional habitats are the sites of ongoing ecology studies. With 2600 acres of mixed habitats, the Hopkins forest harbors a wide array of wildlife species native to the Eastern North America. 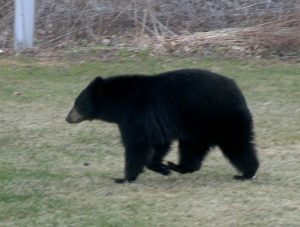 Among the mammals, white-tailed deer, black bea r, porcupines and bobcats are the more charismatic although, in the forest, all orders are present–down to bats, mice, shrews, and moles. Birds are represented by over 125 species of which over 40 nest here, including the black-capped chickadee, black-throated blue warbler, Eastern wood pewee, hermit thrush, ruffed grouse, American Woodcock, yellow-bellied sapsucker, and barred owl. Reptiles and amphibians are represented by the numerous milk and garter snakes and American toads in the summer and an array of verna l pool breeders–spring peepers, wood frogs, gray tree frogs, green frogs, red-spotted newts and spotted salamanders in the spring. There are several species of darters and minnows in the streams, and a world of invertebrate life teeming from the stream bottoms to the tree canopy. 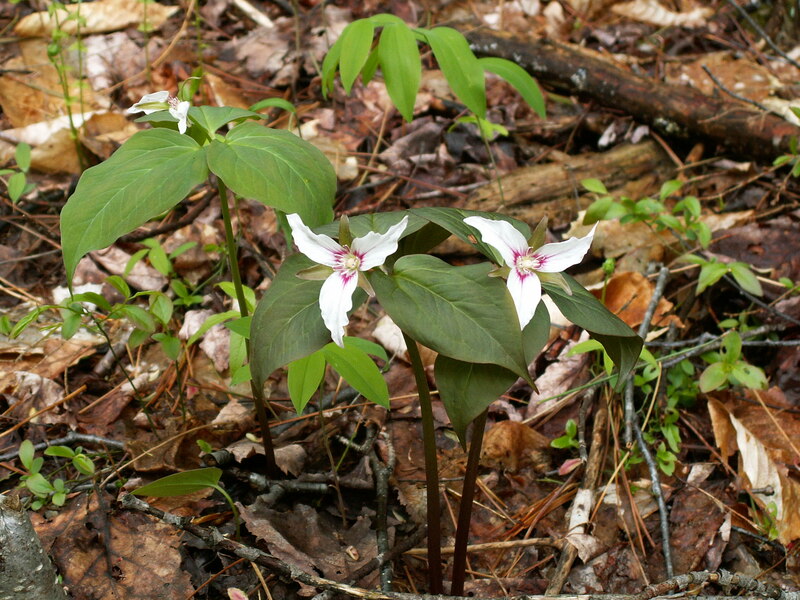 For more information on research opportunities and resources in the Hopkins Forest, contact the Forest Manager.